"Some people think that it's [intimate partner abuse] not that serious because we're teenagers. They just say that we'll grow out of it." As sexual harassment and discrimination directly impact economic success, intimate partner abuse and domestic violence are public health crises that explicitly shape city planning challenges, including access to safe and affordable housing, connectivity to transportation, and access to social services. Young people are one of the most vulnerable demographics impacted; one in three adolescents in the U.S. is a victim of physical, sexual, emotional or verbal abuse from a dating partner, while 1 in 15 children are exposed to intimate partner violence each year. Furthermore, to stop cycles of intimate partner abuse and domestic violence, city leaders and practitioners must understand these issues through the lens of young people and account for the unique challenges that arise within schools. With the growing momentum of #MeToo, there is an opportunity for schools, the battleground of the movement for young people, to further promote equity, safety, and reciprocity in intimate relationships and in the classroom. This begins with taking youth seriously, by educating them about healthy intimate and professional relationships and offering them a seat at the table in changing the status quo. For the third year in a row, the New York City Mayor’s Office to Combat Domestic Violence (OCDV) has risen to this challenge by working in partnership with Y-PLAN NYC students to make schools hubs of healthy, equitable dating behaviors and leveraging the power of young people to combat abuse across the city. What Y-PLAN students are doing in these projects is harnessing the school –the built environment and social resources- as a site to disrupt cycles of intimate partner abuse, domestic abuse, and non-consensual behaviors. 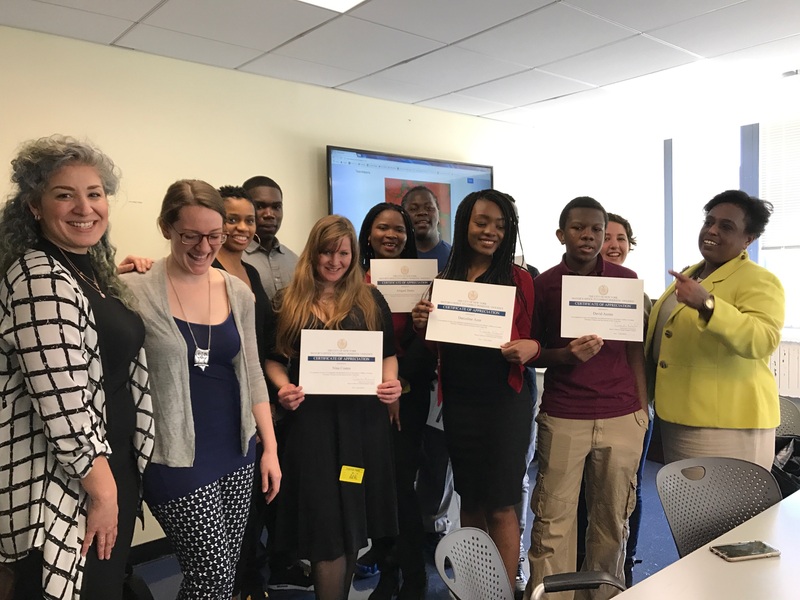 OCDV Director of Outreach, Tesa Arozqueta and Director of Youth Programs, Lizzie Falcone became some of Y-PLAN’s first New York clients in the Fall of 2015, strengthening the scope of the office’s already stellar work with youth in the Healthy Relationships Academy. Pilot projects in the 2015-2016 school year launched in Brooklyn at George Westinghouse CTE High School’s culinary arts class and Urban Action Academy’s senior English class. George Westinghouse’s culinary arts class was a unique fit for a project, putting Y-PLAN’s interdisciplinary curriculum and methodology to the test. 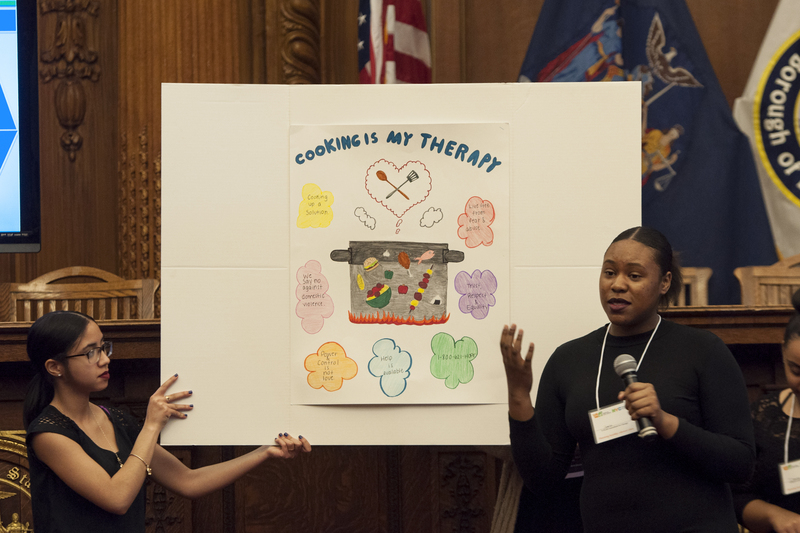 But with the support of healthy relationships academy training from Tesa and Lizzie, students were able to create highly innovative recommendations that answered the question: How can students support domestic abuse victims in high school through culinary arts? The Y-PLAN process guided students through surveys and interviews with their peers, as well as site mapping of a family justice center to understand the services OCDV offers survivors seeking shelter, food, clothing, safety, and daycare. Recognizing the social stigma of domestic abuse and that some survivors may risk their safety by seeking resources online, students created cookies, packaged with the NYC abuse hotline and Family Justice Center information that could be given out in schools, local bakeries, and businesses to discreetly reach out to abuse survivors. From their site tour to the Family Justice Center, students realized that the food selections were limited. In response, students created menus of affordable meals that can be cooked quickly on hot plates in shelters, where the physical space and access to kitchen is limited. The same year, Urban Action Academy’s English class addressed the question: How can we raise awareness and increase access to services for teenagers and their families about intimate partner violence? 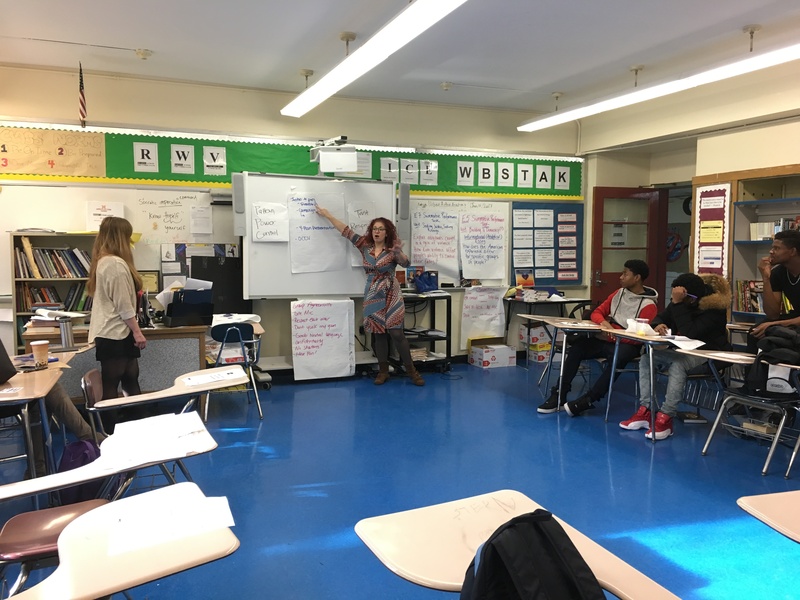 Students followed a similar process to their peers across the borough, creatively integrating the project into their senior English curriculum by analyzing Hamlet as a critical text to understanding unhealthy or abusive relationship dynamics. In their project, titled, Breaking The Silence: See Our Pain, Hear Our Words, Speak Justice (see policy brief here), the class proposed a city-wide contest which would consist of words and arts submissions from teens (grades 7-12+) that address the issue of intimate partner violence, honor survivors, raise awareness about the extent to which intimate partner violence occurs and highlight the many lifesaving services offered by the Family Justice Centers. 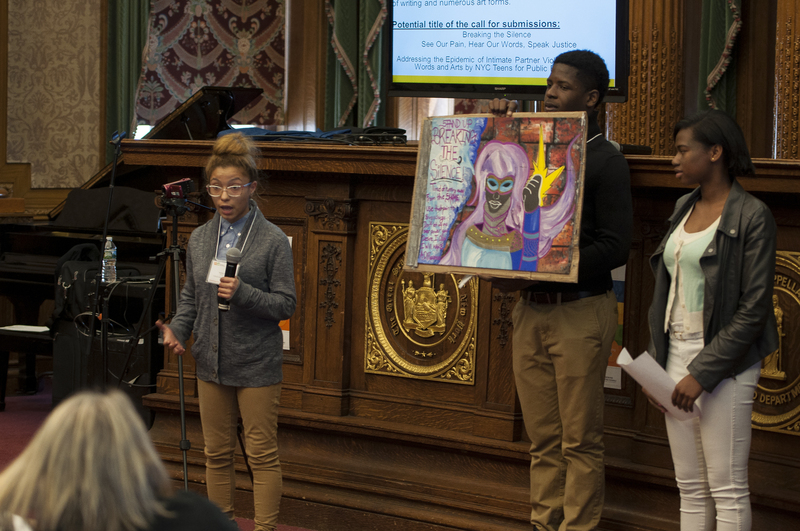 One students’ artwork about her experience as a survivor of abuse and her persistence to break the silence was showcased the following October in an exhibit at OCDV’s Manhattan Family Justice Center during Domestic Violence Awareness month. The stigma that men are always abusers in unhealthy relationships can further silence men experiencing abuse. Much of the current language in anti-abuse campaigns is heteronormative and exclusive to gender non-binary people. Young people model norms and behaviors about healthy relationships from media and celebrities. Promote the mission of Teens 2 Teens on social media during domestic violence awareness month using snapchat, facebook, and instagram filters. Post their stories (anonymously if they choose). Learn about dating abuse through resources like the wheel of equity and the wheel of power and control. Access services and hotlines offered by OCDV. Create a teen task force to run the social media profiles for #letthemknow, gather content for the website, and reach out to high schools across the DOE. In an example of the reciprocity of Y-PLAN’s Double Bottom-line strategy, students’ interest in the subject of intimate partner violence grew throughout the project in response to their client’s authentic commitment to engaging youth. Young men in the class especially found their voices, with the encouragement of their teacher and clients to leverage their personal strengths and talents in this project. One student, Ramon, showcased his passion for ending intimate partner violence through a poem, Twilight Heart, that he presented at the Y-PLAN Final Summit and at the Family Justice Center. During the focus group reflection, he noted that “having someone that can shed some light and expand beyond made a difference. I need someone to explain stuff to me personally, and she [clients] really came in and broke it down.” Other young men who were at first reluctant to participate in the project showed their growth in attitudes towards the issue of intimate partner violence through creating art pieces and a mock web page for the campaign. During the spring of 2018 Urban Action Academy is implementing Y-PLAN in an AP Psychology course and addressing the question: How can students change harmful behaviors and build a culture around healthy intimate relationships in schools? This question comes at a crucial moment, where #MeToo and OCDV can offer both young men and women a platform to speak out about sexual harassment and abuse, and shift the tides of future workplaces and intimate relationships, and dig deeper into the psychological reasons behind why intimate partner abuse and sexual harassment are so prevalent in our society. Recognizing that abusive behaviors begin at a young age, Y-PLAN students are surveying and interviewing peers and key stakeholders to understand root causes of the issue and how they can make schools supportive places for teens experiencing intimate partner violence or abuse. This data collected will inform students’ recommendations for change, which they will present at Borough Hall during the Y-PLAN NYC Summit on May 23, 2018.